Elizabeth (Moynihan) Lynch – of Hudson,MA formerly of Acton and Winchester, March 29th. Beloved mother of Kathleen Lynch of Woburn, Jane Lynch Gilbert, her husband Kenneth of Petersham, Jacqueline Lynch, her partner John Robichaud of FL, Christine Witkos, her husband Paul of RI, and Kerry Ryan, her husband Neil of NJ. Cherished grandmother of Jared Lynch-Gilbert, Maille Peddle and her husband Jon, Michael Beaudoin, Macy and Lexi Ryan, Owen Witkos, and the late Evan Lynch-Gilbert. Adored great-grandmother of Kylie, Hazel Mae and Maddox. Dear sister of the late Edward F. Hines and his late wife Jeanne. Betty is also survived by her loving nieces and nephews, Mary Hines of Woburn, Ellen Carbeau of Burlington, Susan Maguire of Woburn, Thomas Hines of West Medford, Stephen Hines of Reading and the late Ned Hines. A Funeral will be held from the Lynch-Cantillon Funeral Home, 263 Main Street, Woburn on Tuesday, April 2nd at 9 a.m. followed by a Funeral Mass in St. Mary’s Church 158 Washington Street, Winchester at 10 a.m. Interment in Calvary Cemetery. 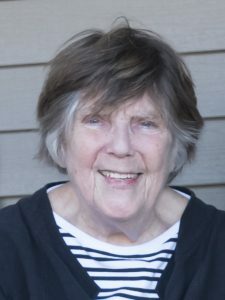 Relatives and friends are respectfully invited to calling hours on Monday, April 1, 2019 from 4-8 p.m.
Elizabeth (Moynihan) Lynch of Hudson, MA passed away on Friday March 29th. A beloved mother, sister, aunt and cousin, Betty was eighty-seven years of age.Born in Winchester, Betty was the daughter of John C. and Elizabeth T. (Kerrigan) Moynihan. Betty was a graduate of Marycliff Academy in Winchester, Class of 1949. After graduation she attended Katherine Gibbs in Boston. While growing up, her family vacationed at Hampton Beach, where she worked in the summers. This is where Betty met Bill Lynch of Lowell, MA who later became her husband. Mr. Lynch was in the Air Force and they lived in Biloxi, MS and Albuquerque, NM, before returning to Massachusetts and settling first in Holliston and then Acton, where they raised five daughters. The family loved the outdoors – hiking, skiing, camping, and sports. Betty was a talented knitter and seamstress. She also served as a Girl Scout leader and softball coach for her daughters. Betty worked for many years at Digital Equipment Corporation, and later at Harvard Pilgrim Health Plan. While working for DEC, she was able to travel the country as a Marketing Specialist. This love of travel continued throughout her life. With friends and family, she enjoyed visiting Ireland, Alaska, and skiing in Switzerland, Austria and France. For her eightieth birthday she returned to Ireland. Betty loved visiting the National Parks and took her grandchildren on trips with her to these as well as to Disney and Washington, DC. Betty was loved by many and will be missed. Betty leaves behind five daughters, Kathleen Lynch of Woburn, MA, Jane Lynch-Gilbert (Ken) of Petersham, MA, Jacqueline Lynch (John Robichaud) of Palm Harbor, FL, Christine Witkos (Paul) of Middletown, RI and Kerry Ryan (Neil) of Montclair, NJ. She was a loving grandmother to Jared Lynch-Gilbert, Maille Peddle (Jon), Michael Beaudoin, Macy and Lexi Ryan, Owen Witkos and the late Evan Lynch-Gilbert. A great-grandmother to Kylie Gryszowka, Hazel Mae and Maddox Peddle. She was the beloved aunt to many, including Mary Hines, Ellen Carbeau, Susan Maguire, Tom Hines, Stephen Hines and the late Ned Hines. Betty was predeceased by her former husband William Lynch and her brother Edward Hines. The family would like to thank the staff at Hearthstone of Woburn for their outstanding and compassionate care these last months. In lieu of flowers, donations may be made to either Woburn Public Library Foundation, 7 Winn St, Woburn 01801, or to The Carroll Center for the Blind, 770 Centre St, Newton, MA 02458. A Funeral will be held from the Lynch-Cantillon Funeral Home, 263 Main Street, Woburn on Tuesday, April 2nd at 9 a.m. followed by a Funeral Mass in St. Mary’s Church 158 Washington Street, Winchester at 10 a.m. Interment in Calvary Cemetery. Relatives and friends are respectfully invited to calling hours on Monday, April 1, 2019 from 4-8 p.m. I am so sorry to hear about the loss of your mother. I am thinking of your family during this sad time. Please accept my condolences. Betty was my neighbor for 22 years. We shared laughter and tears over our experiences..some very tragic..and commiserated over issues in our Village. Her steadfast determination to be independent was an inspiration to me as we both became octogenarians and the aging process presented its challenges. She was a trooper in our Chair Yoga class and I missed the empty chair beside me when she stopped attending. I will certainly miss her. everyday. My deepest condolences to her loving family.. especially to Kathy who provided such loyal and compassionate support to her. Cherish the memories.. She now rests in peace.